Daniele Bennati’s first stage crash in the Tour de Romandie saw the Italian sprinter break four ribs and his collarbone, ruling him out of the Giro d’Italia, which starts in the city of Turin on Saturday. 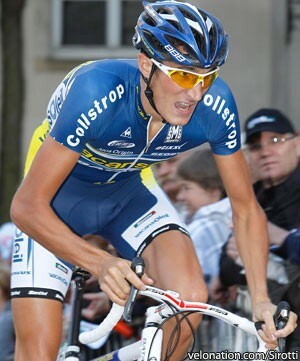 The absence of the rider who won the points jersey in the 2008 edition of the race necessitates a change of tactic for the team from Luxembourg, which has replaced him with French climber Brice Feillu. Brice is the younger of the two French Feillu brothers; he left sprinter elder brother Romain behind after he left the Vacansoleil-DCM team this year, having not enjoyed his time there. In 2009, as a young rider on the now-defunct Agritubel team, the lanky climber won the prestigious Ordino-Arcalis stage of the Tour de France, taking the polka-dot mountains jersey for a day at the same time.